A visit with Master TSUTOMU OHSHIMA. By Arnold Howard. EMBUSEN - The Kata Direction Line. By John Cheetham. Thoughts from Japan. 'By Way of Introduction'. By Dave Hooper. Zenkutsu-Dachi and 'The Wobbly Knee'. By Scott Langley. MIKIO YAHARA Seminar (England). Report By Clare Worth. A study of KIME. By Seamus O'Dowd. AKIO MINAKAMI 7th Dan Shito Ryu. U.S.A. Report By Sean Roberts. Why train YORI ASHI? By Nelson Carrion. 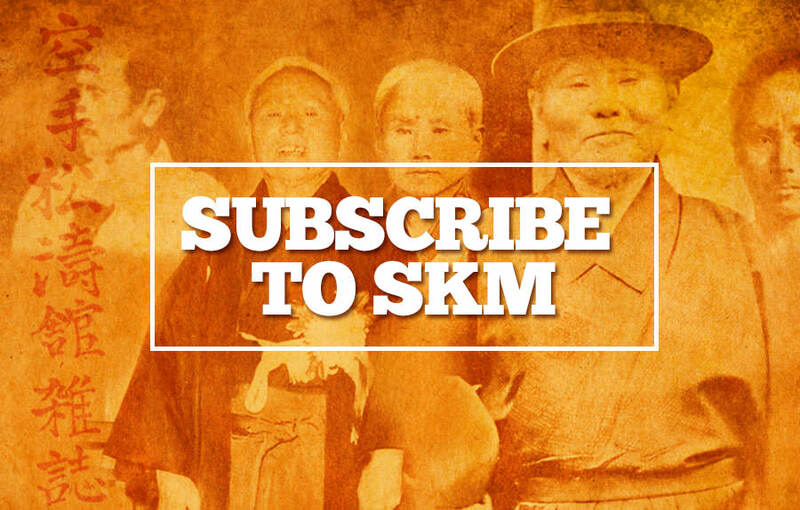 You will all probably recognise the famous face on the front cover of this issue of SKM. The notorious, dynamic, formidable fighter, and former JKA kata champion, sensei Mikio Yahara 7th Dan. 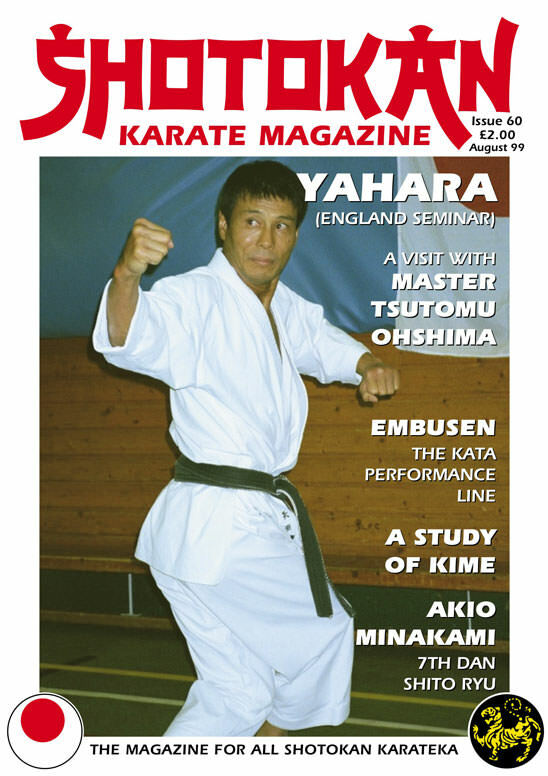 This is the second time he has appeared on the front cover (the last time was issue 26) which is quite a few years ago and Yahara sensei doesn't look a day older! He certainly moves better than ever! SKM secretary (and reporter) Clare Worth 2nd Dan, trained on one of Yahara sensei's sessions when he took a course in England in June this year and we have a good technical report focusing on one of Yahara sensei's 'special' techniques, 'spinning uraken', it's very different! By complete contrast there is a beautiful little story by Arnold Howard, describing an afternoon spent in the company of the famous Ohshima sensei (based in California). This is completely different and a charming little tale which I'm sure you will enjoy. Ohshima sensei like Nishiyama sensei is one of the very few (living) direct students of the Shotokan founder, Master Gichin Funakoshi, so we must listen very carefully to the words of these people who undoubtedly know how karate used to be. However, it is well documented that Nishiyama comes from the JKA linage whereas Ohshima comes from the Shotokai linage of the Funakoshi (Shotokan) family tree. Differing in both technique and political alignment yet sharing the same (Karate-Do) philosophy. Dave Hooper's article in this issue is extremely valid because of his undoubted pedigree in Shotokan karate, having lived and trained in Japan for twenty years. We have published several of Dave's (quite controversial) articles before and there are several more follow-up articles in the pipeline after this one. There are bound to be contentious attitudes in karate but we (SKM) believe in presenting a wide range of views and opinions on important topics and most of these are personal views, not necessarily those of myself or the magazine. I must make this point crystal clear. SKM is about promoting quality karate, traditional karate, especially Shotokan karate, although we have no problem featuring other traditional styles, as can be seen from the visit to Seattle by a British contingent led by KUGB Kata Champion Sean Roberts, to train in Shito Ryu under sensei Akio Minakami. There are certainly some technical opposites in Minakami sensei's approach as compared to the vast majority of Shotokan karateka. In fact his explanation of (physical) kime differs almost totally to that of most Shotokan schools as can be seen in Seamus O'Dowd's excellent article, 'A Study of Kime' on that very subject. There may be huge political differences in Shotokan throughout the world (it's the same with all martial arts) and even slight, to quite dramatic technical variations from one group to another, but hopefully through this magazine, some kind of unity and mutual respect can be maintained regardless of affiliation or differences, and there can still be just one, overall, 'Shotokan Family'. Sensei Taiji Kase 9th Dan, has been seriously ill recently and we 'all' wish him a speedy recovery. Good Training. Editor.